1. Connect the AirNav ShipTrax receiver to your computer using the USB cable provided. It is also possible to connect using an Ethernet port (to your router) or using a serial cable. 3. Start Tracking ships in real-time! ShipTrax Network is a complete worldwide ship data bank with detailed information of on over 10 thousand ships worldwide. This information includes ship position, destination port and arrival time, ship dimensions and ship photo. 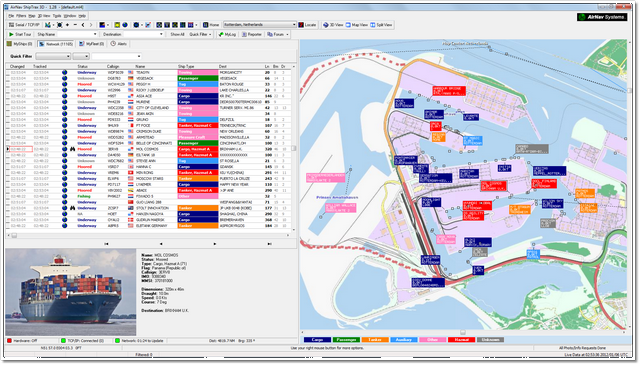 AirNav ShipTrax is the most advanced Windows based Ship Tracking application. By receiving ship data from various sources (AIS, TCP/IP, AIS Networks) you will be able to track ships all over the world in real-time. This product is something never seen in the marine community and results from a 15 year experience in the development of high-tech award winning aviation solutions. Details shown include Ship Name, Position, Photo, Navigation data (location, speed, track), IMO/MMSI/Callsign, Ship Type and dimensions. 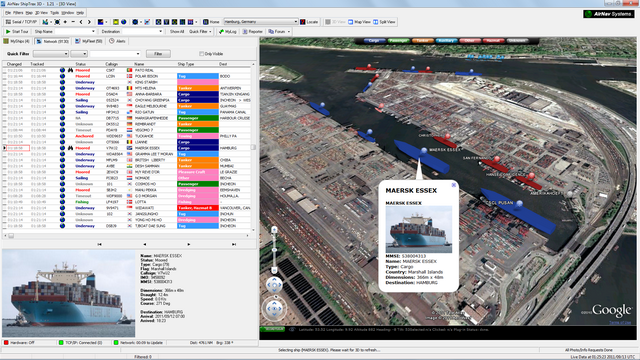 The MyLog feature maintains a database of all received ships, last known position and voyage details. No third-party software or apps with hidden costs required. 3 The only AIS Receiver with USB + Serial + Ethernet simultaneous output. 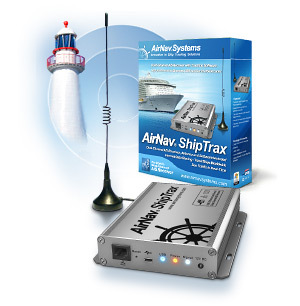 8 Software 100% compatible with any other AIS receiver or TCP-IP feed. For the first time an AIS Receiver System integrates Real-Time and Networked Ship Tracking. Worldwide coverage. Forum: Join our Community and visit the ShipTrax Forum to learn more.